I have, sitting on my desk, about 25 new books that I got at SBL and elsewhere – can’t wait to be done with finals grading and kick back with a good book (or 2 or 20) during the Christmas break. I would like to spotlight or review each and every one eventually, but for now I would like the mention five new and interesting books on Jesus and the Gospels. Unity and Diversity in the Gospels and Paul: Essays in Honor of Frank J. Matera (eds. C.W. Skinner and K.R. Iverson, SBL). While Festschriften tend to be “hit or miss” in terms of how insightful they are, there have been several as of late that have been “keepers.” I especially like when FSs truly engage with the honoree by focusing on a particular subject where the honoree made his or her mark. This is absolutely the case of this FS as it looks at this unity/diversity dialectic in NT theology, a hallmark of Matera’s work. The Synoptics are given special attention in the first half of the FS (“Unity and Diversity in the Gospels”), with eminent contributors such as Francis Moloney, Jack Kingsbury, John Donahue, Paul Achtemeier, William Kurz, and John Meier.I am particularly interested in Donahue’s essay: “The Lure of Wealth: Does Mark Have Social Gospel?” (71-94). Jesus, Matthew’s Gospel and Early Christianity: Studies in Memory of Graham N. Stanton (eds. D.M. Gurtner, J. Willitts, and R.A. Burridge; T & T Clark). Speaking of Festschriften! Here is another one, this time for the late Graham Stanton. While I did not have the privilege of ever meeting Prof. Stanton, he was known through the UK as a true gentlemen, the kind of scholar and all-around gracious fellow that most students desire to emulate. Contributors in this FS (almost all focusing on Matthew) include Richard Burridge, Scot McKnight, James Dunn, Don Hagner, Craig Evans, Chris Tuckett, and David Catchpole (among a few others). What a fantastic memorial and tribute! The one problem is that this FS retails for $120, while the Matera FS sells for $50! Cost, in either of these cases, does not reflect quality! It is simply the way publishing works (sadly). Reading the Gospels Wisely: A Narrative and theological Introduction (Jonathan Pennington, Baker). I just finished reading this book rather recently and I must say that it is extremely well written and a very fresh theological perspective on the hermeneutics of the Gospels. Like a good dialogue partner, I found myself at times nodding in agreement with Pennington, at other times scratching my head in confusion, and even still wanting to throw the book across the room out of frustration and disagreement! That is a good thing! He’s making me think! I talked with Pennington at SBL and congratulated him on the book. I told him, quite directly, that I was surprised that a profess at Southern Baptist Theological Seminary had the [shall we say ‘guts’] to push some of the buttons that he does in the book. One can even get a sense for this “button-pushing” in Thomas Schreiner’s tempered back-cover endorsement where he says “While I don’t agree with everything Pennington says…” I never thought of myself as the “conservative” while reading a book by a SBTS prof, but, sure enough, I was! Thanks Jonathan for your boldness. I will have a series of blog posts on this excellent book, underscoring, not the Good/Bad/Ugly, but the Great, the Good, and the So-So. 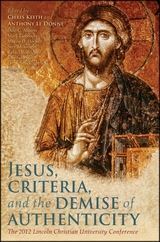 Previous postYour favorite Jesus scholar (asks Le Donne)? And Paul?